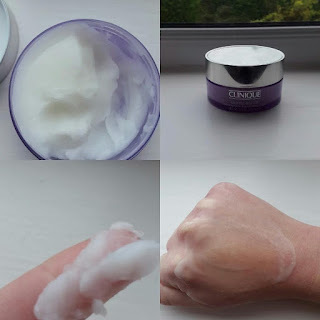 So today i'm going to be reviewing a new cleanser i've been trying out for the past 2 months and it is the Clinique take the day off cleansing balm, first of all this cleanser costs £22.00 for 125ml, it's not too expensive but still not cheap, and you can purchase this cleanser from nearly every department store. This cleansers claims to be a lightweight cleansing balm which quickly dissolves stubborn makeup. This cleanser is a solid balm in the tub, the only way to describe this cleanser is like lard, but it transforms from a solid into a silky oil when worked into the skin. This cleanser is not greasy, non-drying and is suitable for all skin types. The way I use this cleanser is by taking a pea size amount and rubbing it in my hands then working it into my skin, I use this cleanser with my Clarisonic and it works like a dream, the reason I use it with this cleanser is so I can get a deep cleanse and exfoliate at the same time without drying out my skin, after I use my Clarisonic I then get a flannel and rinse the cleanser off. Overall I am really impressed with cleanser, the packaging is sturdy but sleek looking at the same time, you get a reasonable amount for your money, there is no nasty chemicals it which is a big bonus, the only thing is that there is no scent which doesn't bother me but I know some people that like having a scent, so you do need to take that into consideration when purchasing this product. But what I love is because it looks and feel like lard it doesn't clog my pores which you would like it does being a heavy oil. Overall this product has a big thumbs up from and I would repurchase and recommend this product to everyone because it suitable for any skin types.